Topshop Petite Snaked Skin Dress, Size 4. Dispatched with Royal Mail 2nd Class. 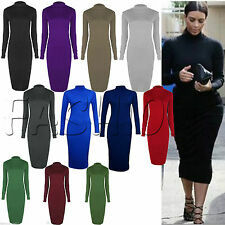 Womens clothes Size 6-8 Long Sleeve Warm Polo Red Midi Party Bodycon Dress. A great dress that can be worn lounging around at home or with A lush pair of tights and heels for a night out on the town. Inside is a fleece style material keeping you lovely and warm yet comfortable too. More colours available. Brand new end of line stock. Please see my other listings for more items Dispatched Royal Mail 2nd class. Bodycon Dress Size 10 Long Sleeve MulTicoloured Stripe Turtle neck. Brand new condition. Perfect for spring/ summer! Womans black boohoo bodycon midi ribbed polo neck dress size 10. Condition is Used. Dispatched with Royal Mail 1st Class. Beautiful dark navy blue dress from Primark. The material looks and feels like velvet and is stretchy. The dress has padded shoulders, a high neck, cut out back and closes with two buttons on the back of the neck. Waist 28". Labelled UK Size 10. Length 30". Fab sparkly black bodycon style stretch midi dress from the gold label range at H&M. It's a lined dress with a turtle neck, a cut out section at the back, a back vent on the skirt and long sleeves !